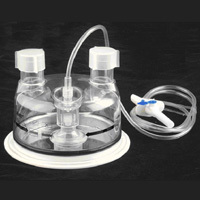 This disposable chamber is designed to single used, please do not sterile and use again. The HC-01 is a Disposable humidification chamber for use with any compatible humidifier heater bases and is recommended for adult applications. The chamber is used to provide humidification for intubated or non-intubated patients. Do not Sterile the chamber again. DO NOT fill the chamber with water in excess of 36°.